It was a strapless Jean Louis Sabaji for Ms. Padukone at the Filmfare Glamour and Style Awards and I have a feeling this appearance of her will get mixed reactions. I had to go back and refer to the look book version to figure out the actual color of the gown considering the stylist images made it look more peach and the photog ones, a bit neonish. Color aside, the idea to keep the hairdo sleek to balance out the look was a good move, I just thought the pumps were a bit of a snooze. What did you think? Malaika attended a jewellery awards ceremony wearing a silver gown by Jean Louis Sabaji. Opting for this gown with its one-shoulder sleeve and neck detail was a risk that didn’t quite pay off. It just looked bad. I imagine the neck and sleeve cut off and liked it so much better. 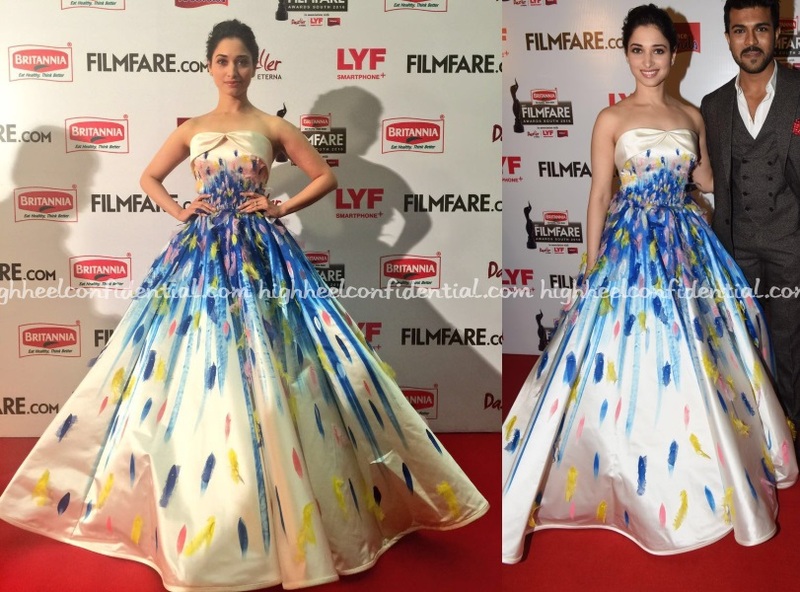 At the Filmfare Awards South, Tamannaah opted for a gown by Lebanese designer Jean Louis Sabaji. Hair in an updo, she kept the look simple wearing the strapless voluminous gown with delicate jewellery. The Kapoors always keep it interesting by wearing designers that we wouldn’t otherwise see on these pages. At the Filmfare Glamour & Style Awards, Sonam gave us a first-time sighting of a Jean-Louis Sabaji creation from the Lebanese designer’s Fall 2015 collection. As far as styling was concerned, the actor didn’t foray too far from the runway one, wearing the feathered gown with a wet hairdo but swapping the black swan eye make-up for a winged one. As dramatic as the look was, unfortunately we weren’t fans of the gown itself and didn’t really think the wet-look worked with the gown either.